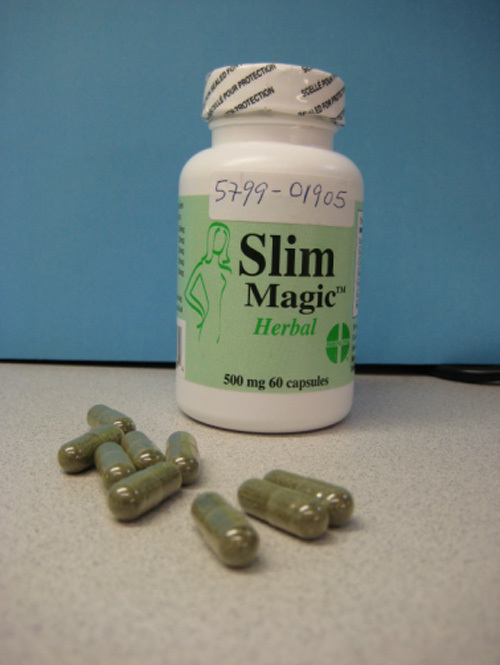 OTTAWA, ONTARIO--(Marketwire - June 4, 2009) - Health Canada is warning consumers not to use the unauthorized product Slim Magic Herbal, which is promoted as a weight-loss product, as it was found to contain an undeclared pharmaceutical ingredient similar to the prescription drug sibutramine. Canadians who have this Slim Magic Herbal product are advised to immediately discontinue its use. Sibutramine is a prescription drug used to treat obesity. The use of sibutramine may cause serious side-effects, including cardiovascular reactions, such as increased blood pressure, chest pain, and stroke, in addition to dry mouth, difficulty sleeping and constipation. Sibutramine should only be used under the supervision of a healthcare practitioner. Sibutramine should not be taken by people who have had a heart attack, coronary artery disease, heart-related chest pain, irregular heart beats, congestive heart failure, a stroke or symptoms of a stroke, in individuals with controlled or poorly controlled high blood pressure, or in patients who are depressed or have a pyschiatric illness. Sibutramine is not recommended for women who are pregnant, breastfeeding or planning to become pregnant. Slim Magic Herbal also contains glucomannan which is a thick soluble fiber used for the treatment of weight loss. As glucomannan has a great capacity to absorb water and expand, it may pose a serious health risk due to obstruction of the esophagus. Slim Magic Herbal products are not authorized for sale in Canada and have been recalled by the company from the Canadian marketplace. Health Canada also warns Canadians not to purchase these products from the Internet or from any other source. Health Canada advises retailers to remove Slim Magic Herbal from their shelves, and consumers to return the product to the point of purchase. Health Canada is taking steps to confirm that the product has been removed from the Canadian market. Health Canada advises consumers not to use Slim Magic Herbal, or any other unauthorized health product, as they may pose a risk to health. Authorized health products will bear either an eight-digit Drug Identification Number (DIN), a Natural Product Number (NPN), or a Homeopathic Medicine Number (DIN-HM) on the label. This authorization indicates that the product has been assessed by Health Canada for safety, effectiveness and quality. Health Canada recommends that consumers talk to a health care practitioner about authorized products for weight loss. Consumers who are concerned about symptoms possibly associated with the use of these products should consult with their health care practitioner. Consumers requiring more information about this advisory can contact Health Canada's public enquiries line at (613) 957-2991, or toll free at 1-866-225-0709. To date, no adverse reactions from the use of this product have been reported in Canada. To have postage pre-paid, download the postage paid label (http://www.hc-sc.gc.ca/dhp-mps/medeff/report-declaration/post_paid-affranchi-eng.php) from the MedEffect™ Canada Web site (http://www.hc-sc.gc.ca/dhp-mps/medeff/index-eng.php). The Canada Vigilance Reporting Form (http://www.hc-sc.gc.ca/dhp-mps/medeff/report-declaration/ar-ei_form-eng.php) and the adverse reaction reporting guidelines may also be obtained via this website.